Effect of matrix stiffness on the susceptibility of primary HDFs to apoptosis induced by inhibition of mechanotransduction pathways. HDFs (primary human dermal fibroblasts) were cultured on collagen-coated polyacrylamide hydrogels that recapitulated the stiffness of normal (4 kPa) or densely fibrotic (50 kPa) skin for 24 hours and treated with or without the agents indicated for an additional 48 hours. Apoptosis was assessed by annexin V staining. Data are means ± SD from three independent experiments. P value was determined by Student’s t test. Targeting the actin cytoskeleton overcomes resistance to HDACi in primary MM. Graphs representing the proportion of cell death induced in MM patients (n=6) treated LBH589 (5 nM), TAE226 (0.5 uM) and combination. Y15 is a small-molecule FAK scaffolding inhibitor that directly inhibits FAK autophosphorylation in a dose- and time-dependent manner. NO production was increased in the netrin-1-over-expressing and recombinant netrin-1-treated MiaPaCa II cells. 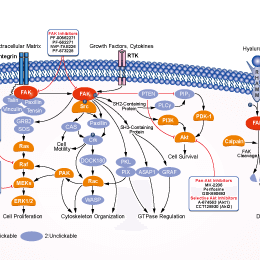 FAK inhibitor PF-562271 blocks the netrin-1-induced NO production. (*P < 0.05). (a) Percentage of apoptotic HepG2 and Huh7.5 cells after 48 h of treatment with DMSO (Vehicle), 0.5 μM or 1 μM PND 1186 measured by Annexin V and flow cytometry. Values are plotted as mean±SD (*P<0.05; **P<0.01; versus Vehicle, n =3). (b) Representative WB for p21 and caspase-3 in HepG2 and Huh7.5 cells after 48 h of treatment with DMSO (0), 0.5 μM or 1 μM PND 1186. β-tubulin is reported as a loading control (n=2). (c) Relative mRNA expression of EZH2 and NOTCH2 genes as measured by qRT-PCR in HepG2 and Huh7.5 cells after 48 h of treatment with DMSO (Vehicle), 0.5 μM or 1 μM PND 1186 (*P<0.05; **P<0.01; versus Vehicle, n =3). Solanesol is a long-chain polyisoprenoid alcohol compound with inhibitory activities toward FAK. It mainly accumulates in solanaceous crops, including tobacco, tomato, potato, eggplant, and pepper plants.